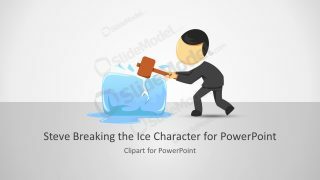 The vector character Juan Thumb Up Cartoon for PowerPoint is a useful professional and creative presentations. The illustration of Juan giving the hand gesture of thumbs up demonstrates the satisfactory or successful outcomes. 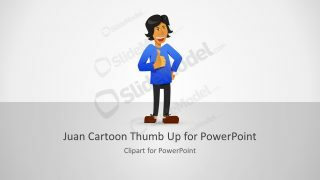 Hence, this clipart PowerPoint of Juan thumb up can help present the appreciation on the achievements. 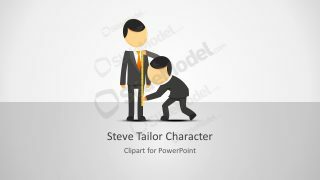 The character itself is a collection of PowerPoint shapes join to create a clipart illustration of human figure. 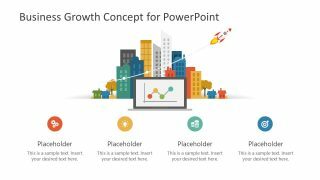 Therefore, it is relatively easier to make certain changes in design of PowerPoint template. The illustration of clipart cartoon template shows a non-professional man in blue short and casual pant. These static cartoons are minimal design modern template to display the information using interactive visualization. Further, the audience can create a mental image of how presenter describe certain elements. 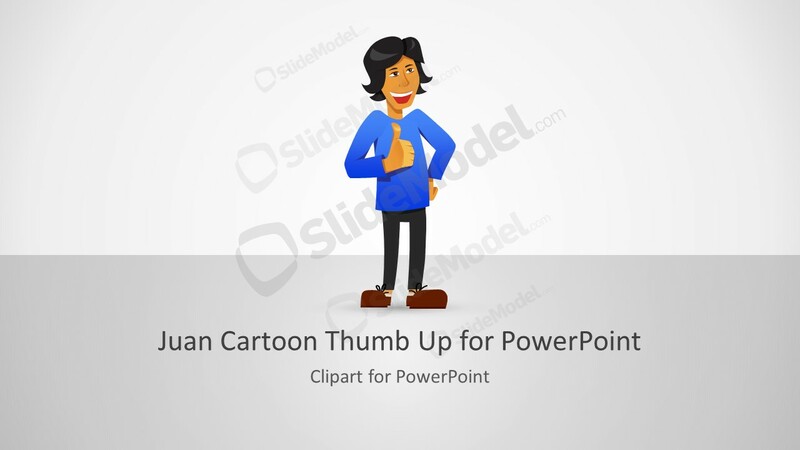 The Juan Thumb Up Cartoon for PowerPoint is a clipart presentation which provide addons for readymade presentations. The users can simply copy slides, cartoon figure or individual elements to reuse them. 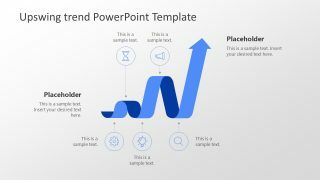 Additionally, the slides of Juan cartoon PowerPoint have two content layouts with the circular infographic icons and text placeholders. 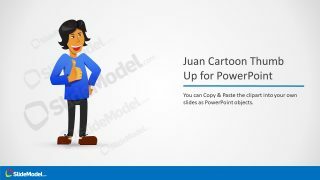 These slides provide the helpful suggestion to customize this editable PowerPoint template of Juan cartoon character. For instance, the first three include resizing, customization of colors and adding shape effects. Further, the last three suggest copy pasting, ungrouping objects and customizing the clipart. These customizations of clipart include changing the colors such as, hair, skin, clothes and shoes. Similarly, rotate and adjust the individual elements after ungrouping. Moreover, use the circular icons and placeholders as bullet point list to add key notes. 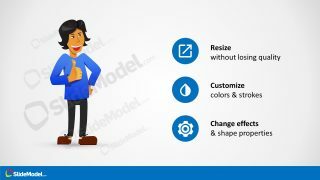 The users can make various customizations to personalize the Juan thumb up cartoon according to their PowerPoint presentations. The clipart cartoon illustrations and avatar help create an eye-catching and an attractive content. 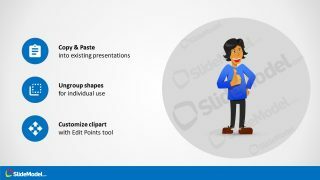 The SlideModel has more cartoon templates such as, Juan taking a selfie.